Lucca is one of the most beautiful cities in Tuscany. The old town has many sights to offer. The wall of Lucca is world famous, it is one of the few completely preserved city walls in Europe. Besides the old amphitheatre from the Roman times, the Cathedral San Martino and some towers are highlights in the old town of Lucca. Lucca is also a city of churches and towers. 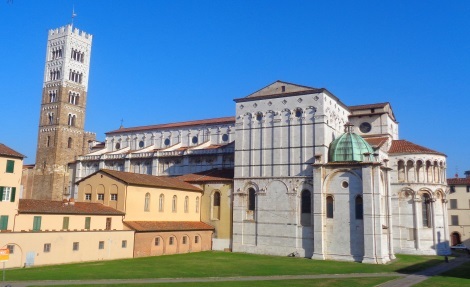 There are more than 50 churches in Lucca and many interesting towers. Several can be climbed. You have a great view of the old town from above. Beside the church tower of the cathedrals we recommend the tower Torre Guinigi. On top of the tower from the 14th century, in the middle of the old town of Lucca, is a small garden with trees (oaks). Also interesting is the highest tower of Lucca „Torre delle Ore“ with a famous clock (climbing the Torre delle Ore is only possible in the tourist season from April to October). All three known towers cost a few euros entrance fee. All the sights mentioned are in the Old Town within the city walls and only a few hundred metres apart. 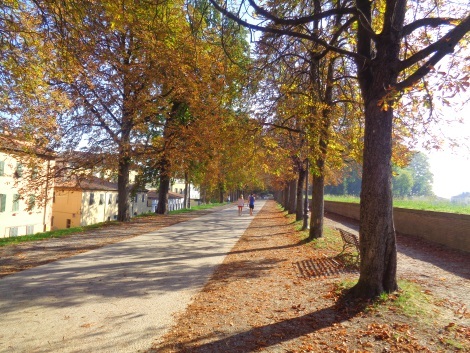 Lucca can be easily explored on foot. However, there are also public buses, some of which run through the old town in minibuses. By train: There are trains every hour from Florence (about 1 1/4 hours travel time), Pisa (20 min, often 2 x per hour) and Viareggio by the sea (20 min) to Lucca. The train station is outside the old town wall, but only about 200 metres from the famous Lucca city wall. There is hardly a city in Tuscany that is better suited for a day trip than Lucca. 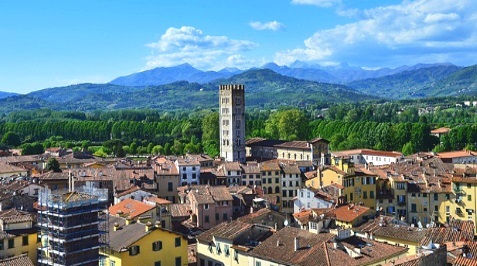 Lucca is not far from the sea and from Pisa.